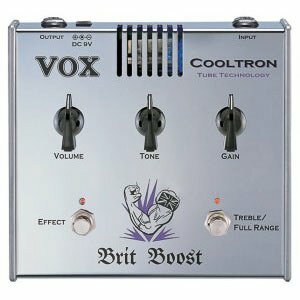 Give your tone extra muscle with the Brit Boost pedal. The Treble Boost setting pumps up the treble and upper middle frequencies, just like you’d expect from a vintage Treble Booster pedal. In the Full Range Boost position the pedal enhances all frequencies. It adds low mids and bottom end to the Treble Boost mode and is good for pushing a slightly overdriven amp into heavy overdrive. A gain knob varies the overall gain of the pedal from mellow and warm to grinding and ripping! Plus, a Tone knob adjusts the overall tonality of the pedal. Of course, there’s a true bypass switch that lets your signal flow through without coloring the tone. Weight (excluding batteries): Brit Booster 1.05kgs (2.31 lbs.